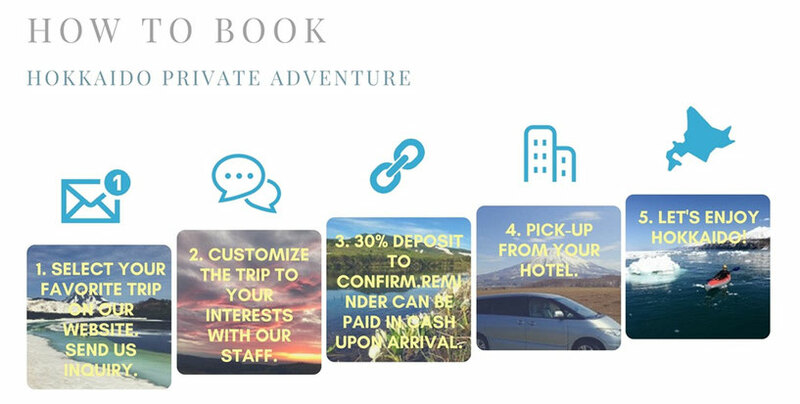 By booking and paying for a trip with Hokkaido Private Adventure, you agree to and accept the following terms and conditions. This agreement is between you, the participating customer (henceforth referred to as “you”) and Hokkaido Private Adventure, (henceforth referred to as “HPA”). 30% deposit must be received no later than 30 days before the start of a tour. Payment can be made by credit card. (Visa or MasterCard). Reminder can be paid in cash upon arrival. There is no travel, travel accident, theft, accident, terrorism, or medical insurance whatsoever included in the cost of any HPA trip or package, ticket, or product unless otherwise explicitly stated. HPA may not be held responsible for your personal belongings at any time including while in the arranged accommodations as well as out in the visited city.HPA cannot be held responsible for loss, theft or damage to any of your personal belongings, regardless of the circumstances. HPA strongly recommends that you are covered by a comprehensive insurance policy which includes: personal accident, medical expenses, emergency repatriation, personal baggage, money and public liability, and any other international insurance required. Every HPA tour member must continue to take all physician-prescribed medication while on a HPA tour.Any costs arising from situations or emergencies that result from complications of not taking prescribed medication are the sole responsibility of that tour member, and HPA will not be liable. Cancellations on the day prior to the tour by you will incur a 50% cancellation fee. Cancellations on the day of the tour by you incur 100% cancellation fee. To be clear, no cancellations/refunds can be issued in the event of illness, missed travel connections, lost baggage or threats of terrorism. Any optional tours and excursions purchased by you are run by local operators and you will be subject to their terms and conditions.